PeliFilip has been selected for the 4th year in a row in the shortlist for “Romanian Law Firm of the Year” at Chambers Europe Awards 2017, recognising the performances of law firms in Europe, after receiving this distinction in 2015. “We are honoured by this new nomination by Chambers Europe especially because we know it is the result of PeliFilip’s entire team and a recognition of our position in the local business law market. 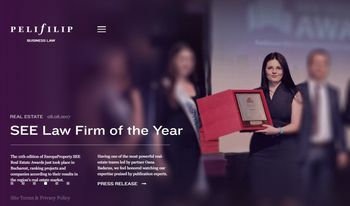 We have continued to strategically grow, to take part every year at top projects in each practice area, to come up with creative solutions for our clients and to support them in their business needs, maintaining at the same time a high level of quality in the services we deliver,” said Cristina Filip, Managing Partner PeliFilip. The Chambers Europe Awards 2017 ceremony will take place on 7th April, in London. Chambers Europe is the European version of the prestigious international guide Chambers and Partners, which recognises every year the law firms with the best results at national and regional levels. Chambers and Partners ranks the most oustanding law firms and lawyers in more than 185 jurisdictions around the world, based on the research made by its own team, interviewing lawyers and clients and enabling a high level of objectivity in evaluating these firms’ performances. The awards recognise the pre-eminence of law firms in the region and reflect their notable achievements over the past 12 months, including outstanding projects, impressive strategic growth and excellence in client service.